The “Enemy” is Grease Buildup in Your Kitchen. We Defeat It! 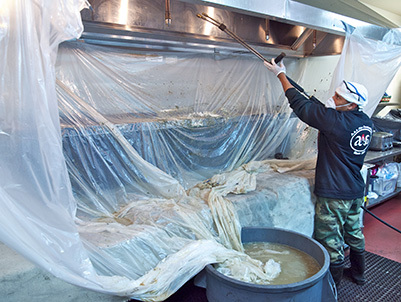 One of the most dangerous elements in any foodservice establishment is grease, especially in exhaust systems. If enough grease builds up, static electricity, sparks and obviously flames from cooking can ignite and cause a terrible fire. 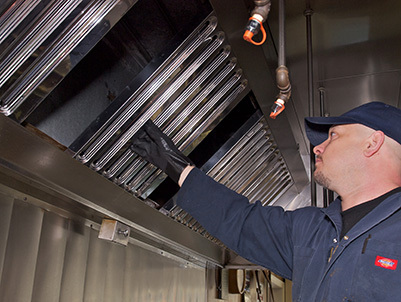 Insurance companies and most city fire departments require kitchen exhaust systems to be cleaned on a regular basis – and with good reason. If that isn’t bad enough, cleaning an exhaust system can be a miserable job unless you have specialized equipment and years of experience. It is not a good idea to leave the job to amateurs. AAA Fire Protection Services is a recognized expert in cleaning grease exhaust systems. AAA Fire Protection Services will provide any documentation required by your insurance company or local fire department as soon as we complete your grease exhaust system cleaning. We have the equipment to clean grease exhaust systems rapidly and thoroughly during your downtime hours. We have so much experience with this type of cleaning that your kitchen staff will hardly know we are there! Most importantly, by scheduling our regular exhaust cleaning service on a routine basis, grease buildup can be controlled before it reaches dangerous levels. Should your establishment have an inspection and the grease has been found to be at a dangerous level in terms of coating the exhaust, we are always pleased to respond on an emergency basis.